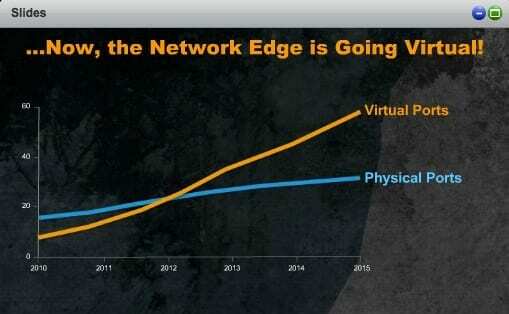 VMworld 2013 in San Francisco got rolling with the Day 1 keynote from VMware CEO Pat Gelsinger. This keynote usually kicks things off and lets the world know what VMware is announcing. These announcements are usually a new version of one or several of their flagship products. I have broken down all the important parts from the keynote for everyone to easily consume. 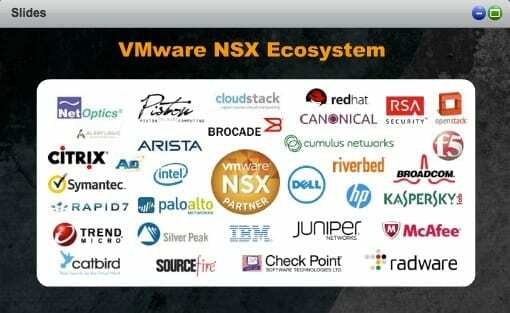 Some of the biggest highlights of the keynote were VMware’s continuing push into IT as a service (ITaaS), and the official unveilings of vSphere 5.5 and the vCloud Suite 5.5. I’ll talk about all of those things in a bit more detail and present some supporting images grabbed from a recent VMware press pre-briefing. It’s no surprise that VMware continues to talk about cloud computing and ITaaS, as both are considered key components in their marketing strategy and product offerings. Pat talked about the phases that companies go through on their virtualization journey, a journey that is broken down into three main phases, as illustrated below. 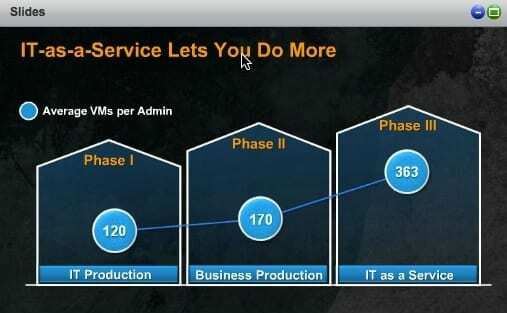 The main point of the visual here is to illustrate that as companies move through these phases the number of VMs per admin that are being managed continues to grow. Gelsinger was painting the picture that the more VMware’s products develop and the more IT automation enters the scene, the more productive each VMware administrator can become. The next slide was used by Pat to explain how applications have evolved over the past couple of decades. Starting off with mainframe applications, moving to client server apps and finally on to todays mobile and cloud-based applications. The point here to me was illustrating that IT resources have and need to become more agile and are being consumed at an exponentially higher rate. Pat then moved on to talk about the Software Defined Data Center or SDDC. This is one of the hotter buzz words lately since cloud computing has taken a beating in the past couple of years. 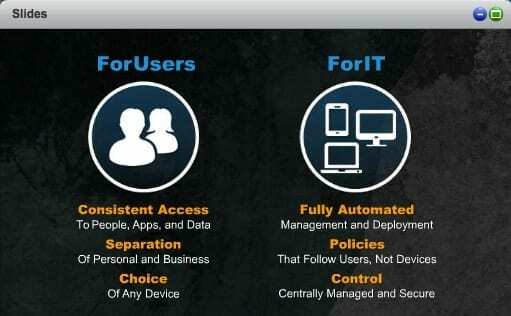 He laid out the four main pillars of SDDC in the following slide, and I’ll expand on each of these below. Up first was the part that VMware made their reputation on, the virtualization of the compute environment. Pat talked about how this has provided freedom for companies and allowed them to move forward in their IT journeys. 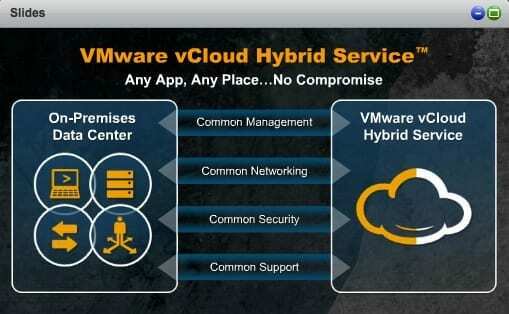 This led into the official announcement of vSphere 5.5 and vCloud Suite 5.5 to the world. Don’t think anyone was yelling it from the roof tops or anything, but the new revisions are bring some pretty cool features. Pat referred to vSphere and vCloud 5.5 as the “2x versions,” meaning that many of the configuration maximums like vCpu and memory were doubled in the new release. Another big feature was the ability to create larger than 2TB virtual disks, something that is important to a few use cases but has long been a thorn in some peoples sides. I will be releasing more in depth posts around all the specific product releases this week and next. 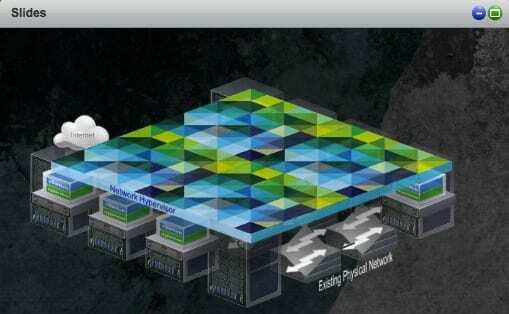 This brings us to the second pillar of VMware software-defined data center (SDCC) story, which is storage. Typically storage has been something that was physical and provided by another vendor. VMware is looking for ways that they can add software based control and management to these physical resources much like they did with compute. 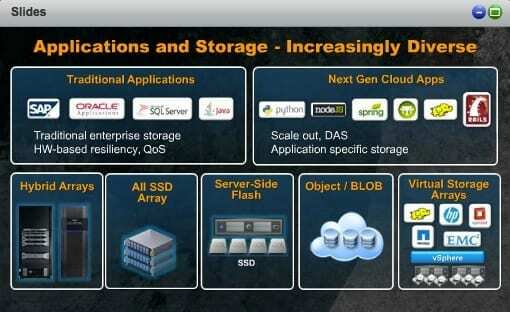 The next slide talks illustrates some popular applications and the many different types of storage that they may use. There are now many different storage offerings in the market place from hardware and software vendors. Each vendor trying to create something that is easier and better than the last. 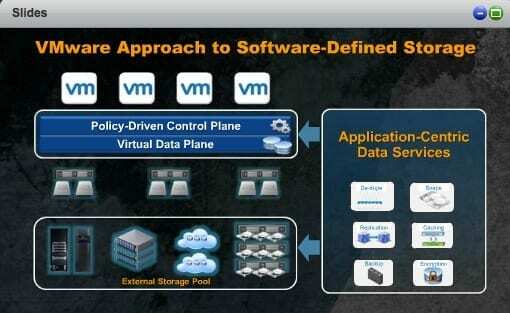 This brings us to VMware’s approach to creating Software Defined Storage. Whoa there is a lot of Software Defined talk going to happen this week. 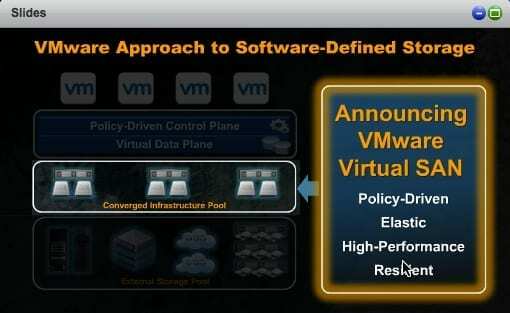 VMware is trying to create a control pane that can be used to aggregate storage services and more easily tie them into application services. One of the new features announced during the Keynote was Virtual SAN or VSAN. This feature will take the local storage within a group of hosts in a cluster and aggregate them into a shared volume that can be utilized to provide storage for VMs. This isn’t something thats terribly new, as VMware had previously attempted this with the VSA that was a virtual appliance based solution in the past. This new offering is based on SSD and spinning disks in each host and will use local caching to accelerate the IO. 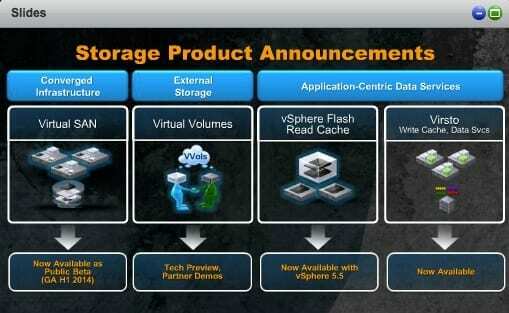 The next slide up illustrates the full breadth of VMware’s storage offerings. 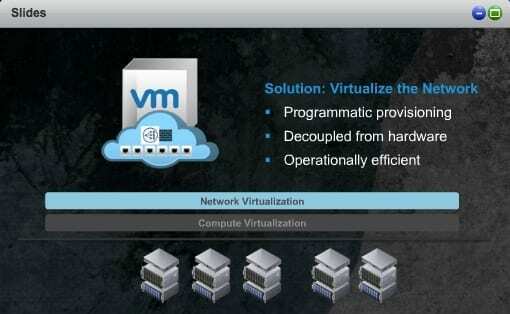 Several of these features are new and have been talked about at last years VMworld. Also included was the Virsto the acquisition that VMware has been working on integrating and getting teams up to speed on. Next up was the network layer, something that VMware has been dabbling in over the past years with their vShield products. That were rolled into the vCloud Networking and Security (vCNS) offering last year. Also the Nicira acquisition in a big part of the Software Defined Network vision for VMware. To help with explaining the networking vision Pat brought Martin Casado the CTO of networking at VMware on stage. Martin began to break down how Nicira is doing to the network layer what vSphere did for compute over the last ten years. The next slide illustrates how Nicira acts as a Network Hypervisor on top of your virtual and physical infrastructure. Kind of hard to tell from the slide since it built in sections. To go along with the vision that was talked about last year that more VMs were created than physical servers, Martin explained that naturally the number of virtual network ports had also overtaken the number of physical network ports in 2012. This only makes sense since each VM will no longer consume its own physical port and naturally the number of virtual ports will scale with the VMs. As part of the Nicira offering there will be ways for the networking ecosystem to leverage the networking layer that VMware has built. This slide illustrates many of the networking partners that have already built or are working on integrations with Nicira and VMware. We’d love to hear from Petri readers who are using VMware and Nicira, so feel free to share your experiences in the comments section of this article. 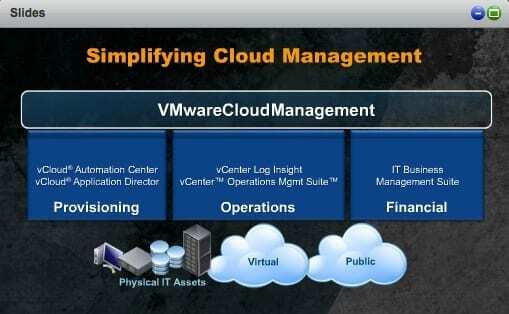 The last pillar up in the SDDC vision is the management portion. After all you can’t go create all this cool software defined stuff and not have a good way to mange and automate it. Then came some love for Open Stack the open source cloud management platform. Pat talked about how they are building their products with Open Stack support to help with the management and networking of this Cloud solution. Up next was the telling everyone about vCHS or VMware vCloud Hybrid Service. 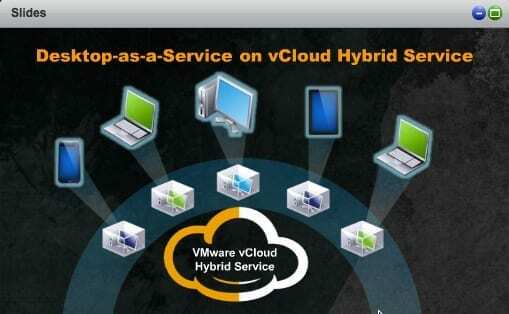 This is the hosted public cloud offering from VMware build on their vCloud technology. It’s marketed as Hybrid Cloud because they would love for you to build your private cloud on vCloud technology and link it to vCHS. The vCHS information was been slowing been talked about publicly since it was first announced in May. But there are still a lot of customers that it will be new to them. 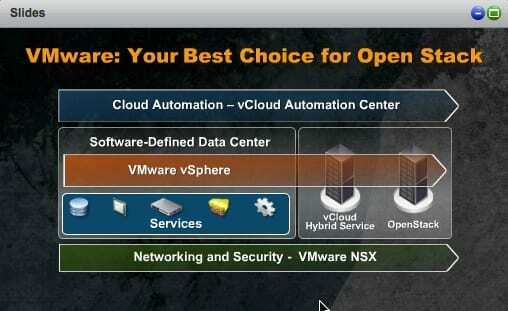 So VMware will be spending a lot of time talking about the vCHS offering at this VMworld. 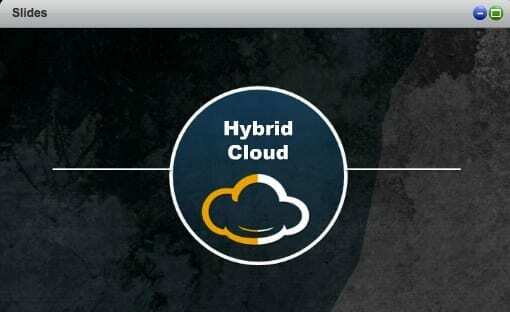 The slide below illustrates some of the main benefits to creating a hybrid cloud with both sides built on VMware technology. This slide was a bit more interesting to myself, since being involved in the vCHS early access program I was able to get up to speed on the base offering before most. But there was a little talk about other offerings that might be tied in with vCHS. This is when Pat talked about a DR solution using vCHS and SRM (Site Recovery Manger) to allow customers to fail over to vCHS. The next was an obvious solution I would think in offering the Cloud Foundry solution on top of vCHS. 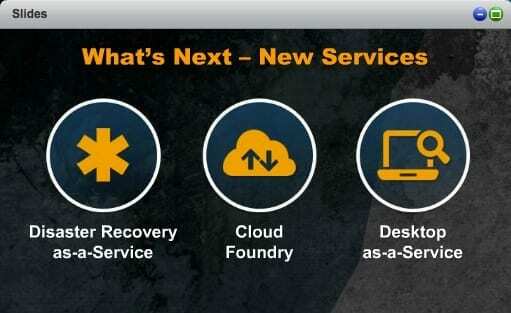 The last one took me by a bit of surprise that VMware was thinking of offering Desktop as a Service on top of vCHS. 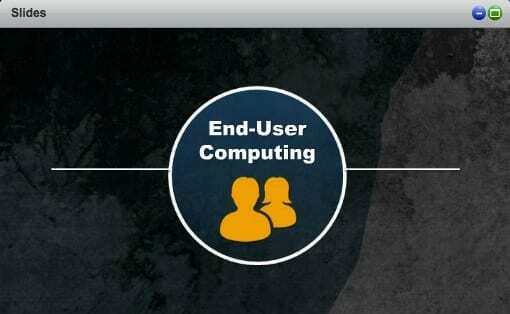 Since EUC (End User Computing) is near and dear to my heart this offering peaks my interest greatly. Will be looking forward to learning more about it. Then Bill Fathers — the SVP of VMware’s Hybrid Cloud Services — talked about the expanding data center foot print for vCHS. Today the solution is based out of a Las Vegas data center with Santa Clara and Sterling coming on line next month. Then Dallas will follow afterwards. Something new was the announcement that Savvis data centers will be used for vCHS offerings and that Chicago and New York data centers will be the first to come online. To wrap things up the last thing to be talked about was End User Computing. I might say they saved the best for last, others would disagree. Pat briefly talked a bit more about an upcoming Desktop as a Service offering that would eventually offer VMware’s EUC products to customers as a service from vCHS. I wish we would have gotten more details about this like when it can be expected, so I hope more details come in the Day 2 Keynote. The eventual plan would be to offer the Horizon Suite or parts of it as a service from vCHS. This means the customers could utilize vCHS to subscribe to View, Horizon and Workspace offerings from the public cloud. This gets my mind racing on the different ways that customers could utilize this in their designs. I look forward to getting more details on this soon. 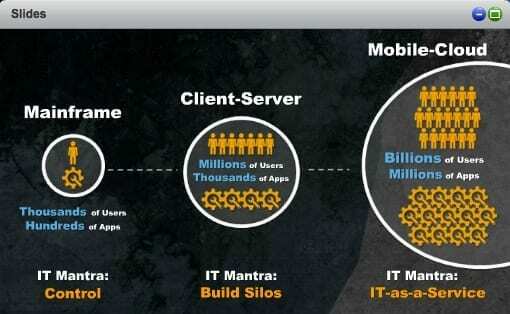 Last up was a slide explaining some of the potential benefits to offering these EUC services from vCHS to customers. These may not hold true for all customers but will certainly look attractive to some. In all the VMworld 2013 day one keynote might not have been as action-packed as it has been in previous years, but it did reveal some tasty details on what is to come. Drop us a note in the comments on what you liked or did not like about the announcements.